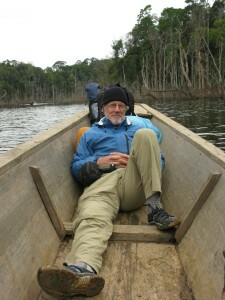 Writer and conservationist William deBuys is the author of nine books, which range from memoir and biography to environmental history and studies of place. A native of Maryland, he attended the University of North Carolina, where he was graduated with highest honors in 1972. Soon afterwards, the writer and social critic Robert Coles brought him to New Mexico as a research assistant, initiating deBuys’s deep relationship with the cultures and landscapes of the Southwest. DeBuys’s books include THE LAST UNICORN (Little, Brown and Company, 2015), named one of Christian Science Monitor’s 10 best nonfiction books of 2015; A GREAT ARIDNESS: CLIMATE CHANGE AND THE FUTURE OF THE AMERICAN SOUTHWEST (Oxford University Press, 2011); ENCHANTMENT AND EXPLOITATION: THE LIFE AND HARD TIMES OF A NEW MEXICO MOUNTAIN RANGE (UNM Press, 1985), which won a Southwest Book Award and is now in its ninth printing; RIVER OF TRAPS (UNM Press, 1990; Trinity University Press, 2008), which was recognized as a New York Times Notable Book of the Year and was one of three finalists for the Pulitzer Prize in General Non-Fiction in 1991; SALT DREAMS: LAND AND WATER IN LOW-DOWN CALIFORNIA (UNM Press, 1999), which won the Western States Book Award and several other prizes; SEEING THINGS WHOLE: THE ESSENTIAL JOHN WESLEY POWELL (Shearwater Press, 2001); VALLES CALDERA: A VISION FOR NEW MEXICO’S NATIONAL PRESERVE (Museum of New Mexico Press, 2006), winner of a Southwest Book Award; and THE WALK (Trinity University Press, 2007), an excerpt from which won a Pushcart Prize in 2008. He co-authored FIRST IMPRESSIONS: A READER’S JOURNEY TO ICONIC PLACES OF THE AMERICAN SOUTHWEST (Yale University Press, 2017), with the late David J. Weber. DeBuys’s shorter work has appeared in Orion, The New York Times Book Review, Doubletake, Story, Northern Lights, High Country News, Rangelands, and other periodicals and anthologies. A Murat Eyuboglu film, THE COLORADO, represents deBuys’s first foray into cinema. The film was inspired by deBuys’s 1999 book Salt Dreams, and deBuys is credited as co-screen writer (with Eyuboglu) and lyricist. Rich in original music, The Colorado (www.projectcolorado.com) has been performed live at the New York Metropolitan Museum of Art and at Stanford University, with an additional live presentation set for March 14, 2018 at the Kennedy Center for the Performing Arts in Washington DC. The Colorado has been regularly shown at film festivals around the country and (soon) as far afield as Frankfurt, Germany. DeBuys has long been active in environmental affairs. From 1982 to 1986 he directed the North Carolina Chapter of the Nature Conservancy and from the late 1980s through the 1990s he represented The Conservation Fund in the Southwest. His efforts have led to the permanent protection of over 150,000 acres of wild lands in North Carolina and the Southwest. From 1997 to 2004 he developed and directed the Valle Grande Grass Bank, a cooperative effort involving ranchers, conservationists, and public agencies in the rehabilitation of rangelands in northern New Mexico. In 2000 the effort earned the National Range Management Award of the U. S. Forest Service. From 2001 to 2004, under appointment by President William Clinton, he served as founding chairman of the Valles Caldera Trust, which administers the 89,000-acre Valles Caldera National Preserve under an experimental approach to the management of public lands. DeBuys earned an MA and PhD in American Civilization from the University of Texas at Austin, finishing in 1982. He was named a Lyndhurst Fellow for 1986-1988, a Carl and Florence King Fellow at SMU in 1999-2000, and a Guggenheim Fellow in 2008-2009. Today he lives on the farm he has tended since 1976 in the remote village of El Valle in the Sangre de Cristo Mountains between Santa Fe and Taos.